The first born son holds a special place in the family especially for mothers. (That's why I would never marry a first born son!) And while I love my daughters and can't wait for all the things we'll get to do as mothers and daughters as they grow up, the relationships differ wildly. 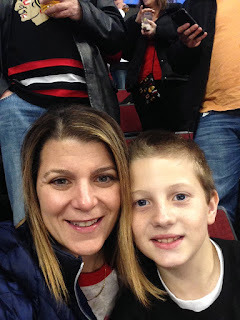 Boys initially probably gravitate to their moms as their primary caregivers in the family but as they get older they want to do more things with their dads and for moms that can be a turning point in a relationship between a mom and her son. On the other hand, girls are close to their moms as young children and then likely grow even closer as they get older. I've noticed this start to occur as Austen has gotten older. He still will seek me out if he's hurt or he doesn't feel well or to help him with his homework, but he really wants to watch sports with his Dad or go and play outside with him too. (The exception of course is soccer.) He still wants and needs me to be home (instead of working) for him, but you can see he wants to do the fun things with his dad (especially after he's had his Dad coach him in 3 different sports this past year). But, I want to do fun things with him too, and recently noticed we haven't done anything together that was just us in a few months. At my suggestion, Tom has taken to developing his relationship with Peyton by doing Indian Princesses with her and that has been great for the both of them since Peyton was such a Mama's girl. Now I need to take my own advice. I don't get alone time with just Austen too often and I know I need to make more of an effort to carve out our time before he gets too busy with friends, school and sports. I want him to look forward to our time together. I want him to feel that we have a special relationship. So I am taking matters into my own hands and planning an outing just for us. Not sure what we'll do but I don't think it matters what it is - as long as I work to keep that connection with my first born son. Often I get asked the question, "Do you miss work?" And I don't hesitate to answer "No." Of course I miss the people and my freedom to check my email, register my kids' for their next class or even go to lunch with friends/coworkers regularly. But, I don't miss the politics, the being away and seeing my kids only for a short time each day especially now that they're older and they know I'm gone. Just a few weeks ago, someone said to me that you can always go back to work, but you can never go back and redo your kids' childhoods and that's so true. Work will be there when I want to go back but for now, I can't even fathom fitting in a few freelance hours on top of caring for three kids and doing some volunteering at their school and on my own. I like being there to pick them up from school and hear all about their days from helping them navigate through someone who stole their prized pencil to figuring out homework and making sure they have everything for whatever practice they are off to next. I don't mind driving car pool. I like socializing with the other moms and getting to know them far better than I did when I was working. I like getting involved in the community and expanding my friendships. I definitely would not have done that if I had been working as my time was very limited. And, I like being philanthropic and attending many social and charitable events to give back. But what I know I will treasure most are those small moments. Hailey's rapidly expanding vocabularly (that no one ever really gets to witness but us since she's so shy). Just last week she said to Tom when he came home from work a bit early - "Daddy, what are you doing here?" Or sometimes it's, "Where's my phone? It's pink." Or even "Come sit here!" And, when I do she demands, "No! Bring your breakfast!" These are moments that I love and I wish I could get them all on tape! Peyton's million questions about going camping with Indian Princesses the whole two weeks before she actually went and when Hailey runs to Austen to give him a hug, randomly. Honestly, I am not missing work at all. Trust me. 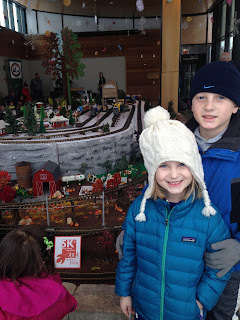 A day off from school and we head to see a train exhibit at the local arboretum. Peyton loves camping. This was her winter Indian Princess camping trip with her Dad. 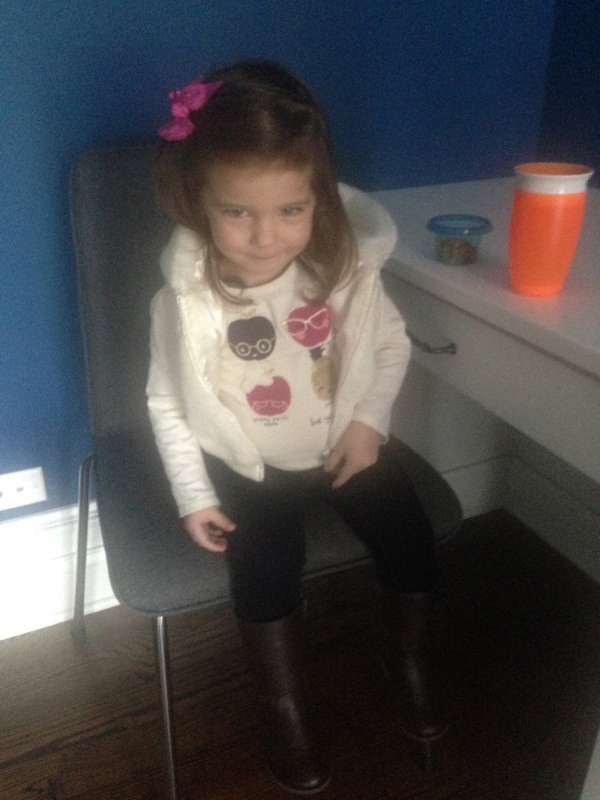 Hailey is just so much fun even hanging out at home! The time has come. 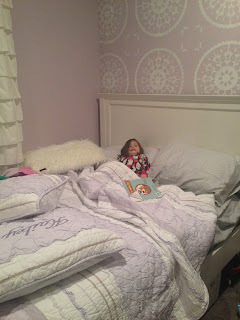 Last night Hailey slept in her big girl bed for the first time. At 2 years and 4 months, she is the oldest of my three to transition to a big bed and the timing was right (so far!). She enjoyed seeing her crib being taken down and wanted to know where it went but she climbed right up into her new bed like it had been there all along. We didn't know what to expect when she went to bed last night or how many times we were going to have to put her back in her bed. Miraculously (maybe because we were owed it because she's our third and we've paid our dues with the other two), she was asleep within 10 minutes and we didn't hear a peep out of her until 6:15 this morning. I was still skeptical when I put her down for nap this afternoon to see if she'd stay in her bed but again she did great and was asleep in another 10 minutes. 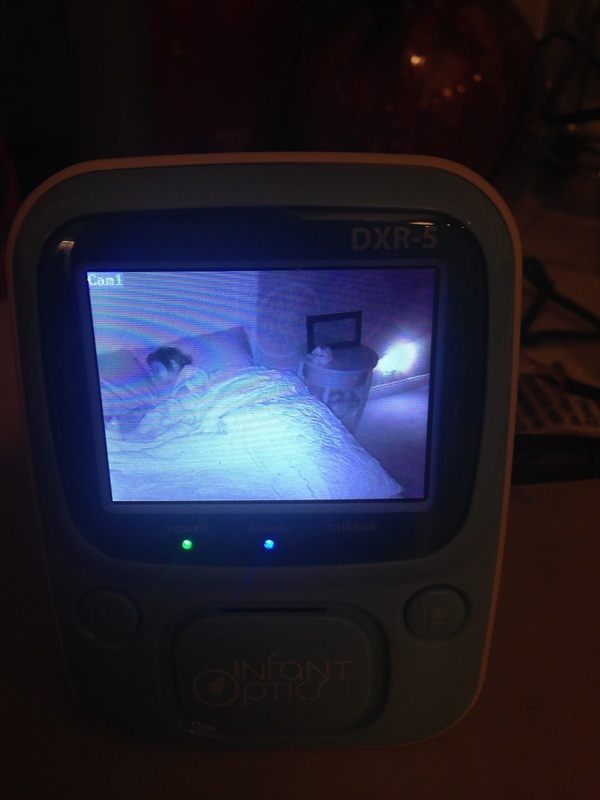 As I write this, I am watching her on the video monitor and she's awake but playing nicely in her bed then alternately resting her head on her pillows, not quite ready to get up. She's not calling me or getting out of her bed. Is it possible that she transitioned this easily to a bed? If so, check. We've completed all of the hard toddler tasks in my opinion and we are well on our way to easy lane when it comes to the little kid stuff. That's after three kids and more than 9 years later. Yes, we've been doing this for almost a decade now and I am ready for the easier little kid stuff like enjoying a nice conversation at dinner together, ski vacations as a family and some of the bigger kid stuff we can't quite take Hailey too yet. Most moms might have shed a tear seeing the crib that all three of the kids use being taken down and knowing that it won't be used again by our family. But this mom is happy to move on to the next decade of years with our family. Although, I'm sure they too will be hard in their own ways. When I was a child I loved to read. I still do to this day although I don't have as much time to do so with young children a foot. But, I still get the feeling of peace and bliss when I walk into a bookstore or a library or even a card store. I love being transported in my mind to another place and time and seeing the story unfold on the TV in my brain. So it is with great pleasure that I tell you that Peyton is reading. She started a few weeks back and has been encouraged by her effort and breakthrough that she is always asking us if she can read to us now. She has been reading so regularly now that she has quickly moved from the A level to the B level in reading at school. Her books are getting longer and the words harder but still she doesn't give up! The other piece of reading is the comprehension. 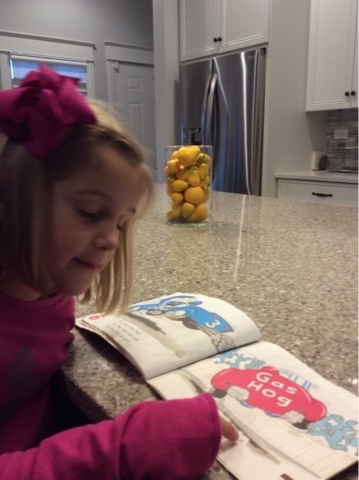 I still do read to her too, and we just finished the book selected by the PTO. I read it to both Austen and Peyton, and I have to say Peyton scored as well or better than Austen in explaining the story and answering questions about it. To say I am not worried in the least by this child moving on to first grade is an understatement. She's going to do just fine!